One of the biggest areas of confusion and misunderstanding between Catholics and Evangelicals is in the area of salvation. How is a person saved? How does a person get to heaven? A classic view of Evangelicalism is that a person is saved by faith alone. In the sixteenth century, reformers like Martin Luther felt their Catholic faith was legalistic and meaningless. To them it had become just a set of rules and routine, formal prayers which meant nothing and which could never save a person. With great excitement they “rediscovered” the Biblical doctrine that a person is saved by grace through faith—and not by any works they have done. This was exciting and liberating news. No longer did they have to be good enough to please God by reciting endless liturgies and enduring grueling good works. God had saved them through the work of Jesus Christ and all they had to do was trust in him through faith to be saved. Some of them took the extreme position that a person is saved through faith alone. This doctrine is called sola fide—only faith. In their enthusiasm to embrace salvation by faith alone, they couldn’t help drawing the conclusion that the Catholic Church taught that a person was saved by good works. It must have seemed like that was the teaching of the Catholic Church at the time, and probably for a lot of ordinary people it felt like their salvation was won by endless prayers and good works, but in fact the Catholic Church had never taught this. The idea that we can work our way into heaven is a heresy called Pelagianism after the fourth century teacher called Pelagius. From that time, and down through the ages the Catholic Church has repudiated such teaching. The Catholic Church has never taught that salvation is accomplished through our good works. But what does the Catholic Church teach on this important issue and why? In fact, the difference between Catholics and Evangelicals on this issue is far smaller than many people think. One of the problems in this debate between the need for faith or works is that both sides have tended to pull out certain verses from the New Testament to use as proof texts. The Evangelicals use some verses from St. Paul’s teaching that “a man is saved by faith, and not by any works of the law lest any man should boast.” Catholics respond with verses from the epistle of James which say clearly that “faith without works is dead.” But this is a bit like two cowboys in a shoot out—both of them pull out their six guns and shoot from the hip. But there’s not much listening going on and the only person they convince is themselves. 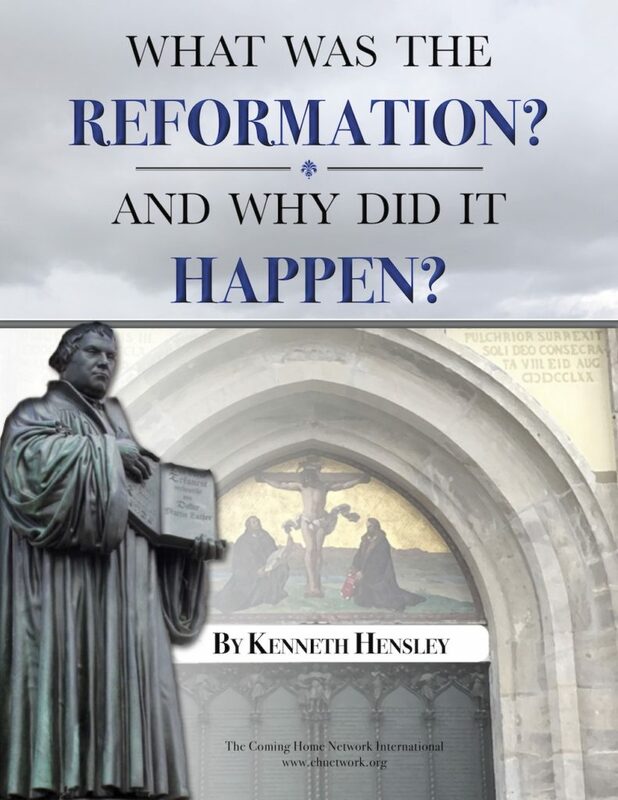 I think the best way to confront this whole issue is to avoid simple proof texts on their own, to avoid also the strong language and emotional experiences of the Reformation times, and to turn back to the Bible as a whole. This is an immense issue to which shelves of theological libraries devote yards of space. I can only hope that a simple overview will help make the Catholic position clearer to both Catholics and Evangelicals alike. The place to begin is the Old Testament, but in the Old Testament we don’t actually hear too much about faith as such. When the word faith is used it usually means the keeping of one’s word, keeping a solemn agreement between two parties. Where it is used in a religious context faith for the Jewish person means keeping his part of the solemn covenant between God and his people, and of course the Jewish person’s part of keeping the covenant was obeying the law. So the basic meaning of keeping faith in the Old Testament means keeping the law, or obeying God’s commandments. But there are one or two other hints in the Old Testament that having faith could mean something more. In 2 Chronicles 20.20 the good king of Israel called Jehosophat calls on the people to “Have faith in the Lord your God and you will be upheld. Have faith in his prophets and you will have success.” Then the prophet Habakkuk looks forward to the day when the Lord’s messenger will come and bring the revelation of God. In that day, says the prophet, “the righteous will live by faith.” But in the context the word faith also means faithfulness so Habakkuk is saying that the one who is loyal, or faithful, or who keeps his word or his part of the bargain will be considered righteous. So all through the Old Testament the person who has faith is also faithful, or loyal. The person who has faith keeps his side of the bargain. But what does this mean in action? Are there any illustrations of faith in the Old Testament? What does the person of faith look like? What does he believe and what does he do to keep his side of the bargain with God? The New Testament book of Hebrews helps us see the Old Testament through Christian eyes. In chapter eleven it speaks at great length about the faith of the Old Testament characters. Hebrews looks back at the Old Testament characters and sees that they were faithful because they had faith in God. In other words, they were able to be faithful, loyal and obedient because they trusted in God’s faithfulness. They were able to keep their end of the bargain because they knew God would keep His part. Hebrews eleven in fact reads like an Old Testament Hall of Fame. First is Adam and Eve’s son Abel. He makes a better sacrifice than Cain because he has faith in God. By faith Noah believed God and built an ark to save himself and his family from destruction. By faith Abraham left the city of his fathers and set out to a country which God promised to him. By faith Abraham was able to become a father even though he was past the age because he considered God to be faithful. By faith Abraham offered his son Isaac as a sacrifice—believing that God could even raise the dead. Now the interesting thing to note in this list from Hebrews is that each one of the Old Testament characters is considered to have faith, but as a result of this faith they perform faith-full actions—actions that are full of faith. Abel offers a sacrifice, Noah builds an ark, Abraham sets out on pilgrimage, fathers a son and then offers him as a sacrifice. Hebrews says by faith they performed these obedient and faith-full actions. The list in Hebrews eleven goes on, and in each case the Old Testament hero is able to perform acts of faith because he believes in God. Isaac blessed Jacob because he had faith. By faith Jacob blessed his sons, by faith Joseph prophesied the Exodus from Egypt. By faith Moses’ parents hid him in the river. By faith Moses led the people of Israel and instituted the Passover meal. By faith he led them through the Red Sea, conquered Jericho and entered the promised land. The writer to the Hebrews goes on to list the heroes from the book of Judges and beyond. By faith they conquered kingdoms, administered justice, shut the mouths of lions, quenched the fury of the flames, became powerful in battle, and went through terrible persecutions. The list recounting the Old Testament heroes is dynamic, full of action and excitement. Faith enabled all these heroes to perform actions which were courageous and faithful to God’s commands. But those actions were not mindless and arbitrary acts of obedience. The actions themselves were meaningful. They taught the faithful ones lessons about themselves and God. They performed God’s will in the world and they helped bring the faithful ones to a higher perfection. Faith and faith-full actions together helped bring the faithful one into deeper relationship with God. So in the Old Testament the righteous person lives by faith, and his faith or trust in God is always shown through his obedience to God—through his faith-full actions. The Old Testament therefore doesn’t say too much about faith as such, but when Jesus comes on the scene the Scriptures suddenly explode with references to faith. Over and over again Jesus scolds His disciples because they do not have enough faith. He says if they have only a little faith they could move mountains. It is by faith that people are healed, and it is through faith that His disciples will do great signs and wonders. In the Old Testament faith was linked with faithful obedience to God’s law, but now faith becomes a dynamic power source in the person’s life. Suddenly Jesus’ disciples will be able to do great things through faith. But Jesus doesn’t say who or what they are to have faith in. As Jews, his disciples would have put their faith in God alone—the ultimate faithful one; and for them having faith meant obeying God’s commands. But in John 2.11 we read that the disciples put their faith in Jesus, and throughout the gospel we’re told that people put their faith in Jesus Himself. In other words they transferred their faith in the law-giving God to Jesus Himself. When you think about it, this is an amazing transition. In doing so they were recognizing Jesus to be the faithful one. In other words, they were recognizing that their solemn agreement to be in a covenant relationship with God was fulfilled by being in a relationship of trust and faith with Jesus. I tell you the truth, anyone who has faith in me will do what I have been doing. He will do even greater things than these because I am going to the Father. We must remember that all through the gospels Jesus fulfills the Old Testament. So it is that here He fulfills the incomplete Old Testament idea of faith. In the Old Testament, faith was the obedient response to believing in a God who was trustworthy and good. But now faith is linked to a real person in place and time—Jesus. Furthermore, faith now includes a personal relationship and it empowers the disciples to do what Jesus does. In the next passage in John chapter fourteen, Jesus speaks further about the person who has faith in Him. He will receive the Holy Spirit, and he will also have a certain new responsibility. In verse fifteen He says, “If you love me you will obey what I command. And I will ask the Father and He will send another Counselor to be with you forever—the Spirit of Truth.” Jesus promises that He will live in them and they will live in Him. The evidence of this is that they will obey His teachings and do what He has done. So in John’s gospel it becomes clear that having faith in Jesus is to enter into union with Him. If a person is in union with Him this will be evidenced in the person’s obedience to Jesus’ commandments. If you like, faith makes the person a part of Jesus—a member of His body. They think His thoughts and do His actions in the world. The fact that this passage is intertwined with His promise of the Holy Spirit shows us that the faith and the good works which flow from faith both have their ultimate origin from God the Holy Spirit. In other words, both faith in Jesus and the actions of Jesus which we do are initiated and carried out by the working of God within us. God gives us a little bit of His power in order to trust in Jesus Christ and to do His works in the world. This gift of God’s goodness, power and light is called Grace. Both Catholics and Evangelicals agree on this point—that we can neither have faith or do faith-full good works without the gift of God’s grace which empowers us. But what does this person of faith have to do? Must they still obey the Old Testament law? Well, in one passage Jesus tells the disciples that they must actually be more righteous than the Scribes and Pharisees—those respectable religious people who obeyed every detail of the law. But what He meant by this was not so much that they had to obey the Old Testament law, but that their new kind of righteousness was to outstrip the Old Testament obedience. It was to be a fresh kind of goodness—as different to the old legalistic way as a color photo is to a black and white picture. Obeying His commands actually becomes not merely an action of pure obedience as it was in the Old Testament. Now obeying Christ’s commands is the way to enter more fully into unity with Him. Obeying His commands in faith now becomes the way His disciples will become like Him, and be made perfect. Here is the important crunch between some Evangelicals and Catholics. The more extreme Evangelicals proclaim that our good works are not worth anything, and that we do not need any good works at all to enter heaven. We are saved purely and only by an act of faith in Jesus Christ and nothing else matters. But can this be so? How can faith take root in our lives unless it is acted on? A good parallel is Jesus himself. He was the Word of God made flesh. Just as the Word had to take flesh in Jesus, so our faith has to take flesh in our physical actions. The book of Hebrews always shows that the heroes of faith in the Old Testament did certain actions by faith. Likewise in the gospels, Jesus the man of Faith, is always acting out that faith with His life, His teachings, His death and His resurrection. So faith which is not acted out in the world is not faith at all. Faith which is just a personal inner religious experience is incomplete. In Matthew 7.21 Jesus says, “Not everyone who says Lord, Lord will enter the kingdom of heaven, but only those who do the will of my father in heaven.” Later in Matthew 25 Jesus tells the parable of the sheep and the goats, in which those who act out their faith through charitable works are welcomed into heaven while those who only gave lip service to their faith are rejected. In the stories of the wise and foolish builders, the Good Samaritan, and the different talents, the faithful ones always perform positive faith-full actions while the unfaithful do nothing—even though with their lips they say they believe. We should also stop for a moment and ask what happens when we do a good work? Let’s say we pay a visit to a person in prison. The visit helps that person, but it also helps us. It is not a meaningless act of obedience to God, the action itself is worth something—it has done some good in the world. As such it has changed us for the better, and therefore been a small step towards our becoming more Christ-like. Hebrews says “Faith is the substance of things hoped for, the evidence of things not seen.” And when we do a faith-full good action we do just that—we give substance to the thing hoped for and evidence for the unseen belief. Therefore, the actions of faith which we complete through God’s grace are a vital dimension to faith itself, and without them there is no faith at all. In these passages St. Paul is not saying that faithful good works are unnecessary for salvation. He is saying that salvation does not come by obeying the Jewish law. Paul, in fact, like the rest of the New Testament writers, says clearly that we are destined to accomplish good works if we are people of faith. So right after the famous passage in Ephesians where he says that we have been saved by grace through faith and not of works, he goes on to say, “For we are God’s workmanship, created in Christ Jesus to do good works.” In other words—just as the gospel taught—through faith we become one with Christ in order that we may speak his words and do his works in the world. What good is it, my brothers, if a man claims to have faith, but has no works?…Faith by itself, if it is not accompanied by action, is dead. You foolish man, do you want evidence that faith without deeds is useless? Was not our ancestor Abraham considered righteous for what he did when he offered his son Isaac on the altar? You see that his faith and his works were working together…You see that a person is justified by what he does and not by faith alone. Evangelicals admit that a person of faith will have to show it through the fruit of their lives, but they will still say that the good works themselves are not worth anything—that they have nothing to do with the person’s entrance into heaven. This is not quite what Catholics believe, and it is important to emphasize the differences—not to cause division and controversy, but because until the differences are brought out into the light and understood they can never be resolved. Catholics and Evangelicals both affirm that our faith and our good works are initiated and empowered by God’s grace alone. But Catholics can’t accept that the good works are worth nothing at all. That doesn’t fit with common sense. Neither does it fit with the many passages of Scripture which show us being judged according to our works. So Catholics admit that our good works can only be done through the power of God, but we also say the good works which we do in this way help to contribute to our final eternal life. This is a little bit complicated, but it is vital to think it through. Catholics fully accept that our salvation was won for us by Christ’s work on the cross and by His mighty resurrection. We accept His saving work through faith in Him, and can only take the step of faith through God’s Grace which empowers us. But our good works are worth something because it is through them that our faith is worked out in our lives and in our world. Our faith is vital because through our works our faith lives, so St. Paul put it this way—”work out your salvation with fear and trembling.” On our own we can do nothing to merit our salvation, but through our good works we can co-operate with God’s saving work in our lives. You can think of it like this. Lets say a child is extremely gifted musically. She has perfect pitch, she has an instinctive ear for melody and understands music with an amazing God-given talent. It is extraordinary and wonderful and will take her to the very top of her profession as a world class musician. But the little girl still needs to practice. The practice isn’t the talent, the practice cannot take the place of the talent, but without the practice the talent lies dormant. It is the practice that makes the talent live. It is the practice which gets rid of the imperfections, the mistakes and the human failures. It is the practice which makes perfect, as the old saying goes. Catholics believe about the relationship between faith and works. Grace gives us the power to both have faith and put the faith into action. But if the faith is never put into action it remains like that undeveloped musical talent. The good works that we do are the way that the faith comes alive in us. It is the way that our imperfections are worked through. The good works of worship, prayer and Christian action are the means by which Christ comes alive in us and by which we become fit for heaven. Through good works practice makes the perfect Christian. For this reason, Catholics believe that good works are necessary. They are not necessary to earn our way into heaven, they are necessary to equip us for heaven. They are not necessary to please God, but to make us more like God. When we do something good it actually accomplishes a real benefit in the world and in ourselves, and so it is through our good works that we work with God to become more like His Son whose Spirit dwells within us. The good works are therefore necessary because this process cannot be done in any other way. Good works are also necessary because by doing the good works we engage our will. We get involved. God has given us free will and through our good works we use it to keep our side of the bargain. Good works are also vital because as human beings we have physical bodies. We are not angels or purely spiritual beings. Because we have physical bodies we have to work out our salvation with our physical bodies. This truth takes us to the heart of the Incarnation because it was in a physical body that Jesus Christ, God’s son, worked out salvation for all mankind through his death and resurrection. All through the Scriptures the heroes of faith are refined and purified by their actions of obedience. Through their obedience, pain and sacrifice they are brought to the perfection that God wills for them. Remembering that Jesus says in Mt. 5.48 that we are to be perfect as our father in heaven is perfect, it is the life of faith which brings us to this perfection. The theological term for this is sanctification. In other words, in Christ God not only saves us, but brings us to wholeness or perfection. This purification can only be done through God’s power at work in us, but His power is enacted through the circumstances of life. We have to co-operate with his power at work in us. So through our choices, our good works, and especially through our suffering we work with God to grow towards wholeness. Now when you think about this its easy to understand another point which Catholics believe in. If our good works and the tough circumstances of life toughen and purify us, then these same disciplines help to weed out the sin in our lives. In other words, it is through our good works and sufferings that we can counter the effects of sin. What do I mean by this? Well, Let’s say we have stolen five hundred pounds from a neighbor. If we go to the neighbor and confess what we’ve done he may very well forgive us, but he will quite rightly still expect us to pay back the five hundred pounds. Paying back the money will be a good deed, but it may cause us some pain. So it takes a good deed and some suffering to counter the effects of that sin. So it is in our relationship to God. God forgives the fact of our sin through Jesus Christ, but we are still responsible for the effects of our actions. We still have to deal with the fallout from sin. You might be forgiven for breaking a vase, but you still have to pick up the pieces. Suffering helps to purify us, but in a mysterious and exciting way the Scripture says our suffering may also help other people spiritually. So St. Paul writes to the Colossians, “Now I rejoice in what was suffered for you and I fill up in my flesh what is still lacking in regard to Christ’s afflictions for the sake of his body which is the church.” In some way the mystery of human good works, self denial and suffering help to complete the work of Christ in the world. So good works and suffering are not just the empty fruit of our faith. As Hebrews says, they are the substance of our faith, the evidence of things unseen. Furthermore, good works and suffering have value in themselves. They change the world and they change us. They don’t save us, but they make our faith real and through God’s grace they can help to transform and purify us. Underlying it all is a belief in God’s boundless mercy and forgiveness. He gives the grace so we can have faith, then he gives the grace for us to put that faith into action. So faith and works are not separate, but one whole action of God with which we co-operate day by day. As we do the faith becomes real and we are finally brought to that perfection and wholeness which God has prepared for us in Christ Jesus from before the dawn of time. This is an edited version of a radio script written for Dwight Longenecker’s apologetics series to be broadcast on London’s Premier Radio. Dwight was an Anglican minister before he converted to the Catholic Church. He now works as Southwest District Organizer for the St. Barnabas Society—the Coming Home Network’s English counterpart. He is also active as a Catholic writer and broadcaster. Dwight and Alison have four children—Benedict, Madeleine, Theodore and Elias.